We started producing small quantities of lumpwood charcoal in 2016, from old hazel, cut in both Bottoms’ Corner, Gravenhurst and Centenary Wood, Pulloxhill, Beds. The wood we are using is a bit too small to sell as firewood but too big and not straight enough for most other uses. We thought charcoal would be a sensible way to make use of it. We were impressed with the quality of the charcoal we produced, so decided to go into production in a small way. We are currently selling bags at £7.50, collected from Gravenhurst. To buy charcoal from us direct, please contact us to arrange a time to collect. We reckon it’s good stuff. It really does light easily* and burns for a good while, nice and evenly, without smoke (until of course your food starts to drip oil onto it). We add nothing to it and you shouldn’t need to use fire lighters, so there’s no danger of tainting your lovely food with noxious stuff. *Try this way to get the barby going – wrap a couple of good handfuls in 3 sheets of dry newspaper and set in your barbeque. Light this and leave it for a couple of minutes. Once things are definitely happening, add more charcoal and leave it alone – go do something else, have a beer, water some plants, look at a tree; it should be ready to cook on in about 20 minutes. 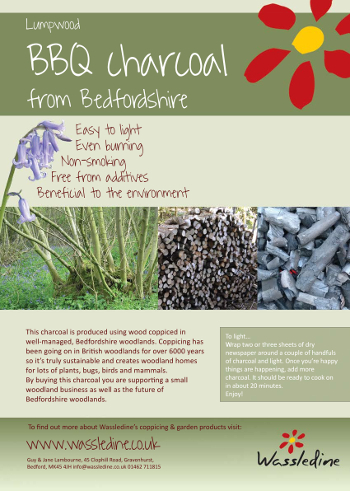 Apart from the culinary advantages offered by British charcoal, the other great thing about it is that by buying our charcoal (or that made by most other British producers), you are supporting small businesses that actively manage woodland, most likely, like us, by coppicing – more information about our woods and coppicing here . If these small coppicing businesses thrive, species that are well suited to coppiced woodlands, such as bluebells, primroses, wood anemones, willow warblers, nightingales, dormice, etc. get a chance to thrive also. And finally… ..if you buy locally produced charcoal, you are reducing the road miles and fuel required to get the stuff into your barbeque, compared particularly with charcoal from abroad. No, really finally this time… ..a lot of imported charcoal is still made from wood cut in pristine forest and mangrove swamps in tropical regions – its production is involved in destruction of habitats that support some of the world’s most endangered species. And that seems like madness to us. When first we started researching the subject, we knew that kilns weren’t the way we wanted to go; they are, in our opinion, hard work, dirty, inefficient, dirty, polluting… and did I say dirty? So in January 2018 we ordered a Hookway retort from ex-artist and retort-charcoal obsessive, James Hookway. Compared to making charcoal in a ring kiln a retort is amazingly clean and efficient. It converts all the initial charge of wood into char using only small waste wood to fuel the process. 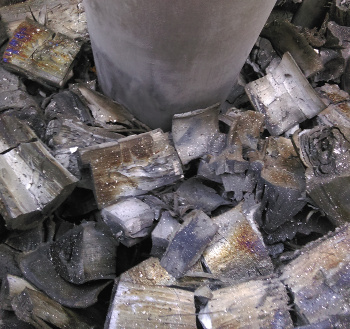 When running properly it produces very little smoke, especially compared to ring kiln. The downside? Well it is a large investment so we now need to sell lots of charcoal. A retort is a decidedly cunning method of charcoal production. 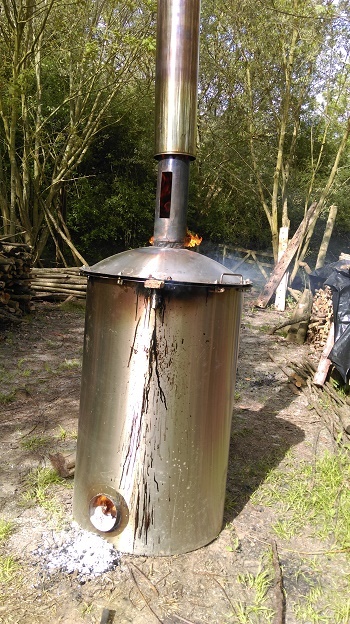 The wood to be charred is sealed into a vessel and heated by burning small diameter waste wood in a central ‘rocket stove’ running through, but not connected to, the wood in the vessel. The temperature rises, driving off all the water from the wood and eventually to a point where the wood releases ‘wood gas’ a mixture of volatile compounds that burn at high temperatures. These gases are vented into the rocket stove and fuel the remaining phase of the charring process. Clever stuff. It’s taken James Hookway several years to develop the stove this far. We’ve had some teething problems, but James has delivered excellent service and we are now approaching full production. The retort certainly produces amazing charcoal. Good quality charcoal has a very high carbon content and that comes from an efficient charring process. It’s light and has a quite extraordinary ring to it when it’s tapped or poured onto your bar-be-que stove. 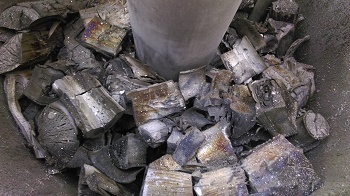 Lesser quality charcoal may not have been fully charred so can still contain some of those compounds that will smoke and smell in the cooking process. Poorer quality charcoal is heavier so tends to be sold by weight.